Designed for the serious gardener who insists on the best quality, this series produces great growing results at an affordable price! Juliana Compact greenhouses are an excellent option for extending your growing season or year-round use. They feature a sturdier frame and improved polycarbonate fastening system. 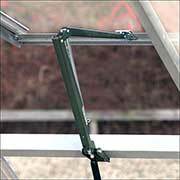 The Compact and Premium greenhouses have a gasket locking system, which secures the polycarbonate to the frame. Simply slide in the panels and secure them with the gaskets included, and your greenhouse is ready to go. 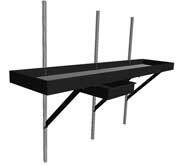 This improvement reduces installation time and makes the panels easy to take out, or to take the greenhouse down. Compact greenhouses also include a sliding door for easy access and adjustable window vents which may eliminate the need for powered ventilation in many areas. The Juliana Compact Greenhouse is a hobby greenhouse that is great for those who want lots of growing space inside their greenhouse. The 7' 5" peak allows tall plants to grow without interruption while the aluminum frame and covering provide weather-tested strength and enduring plant protection. In addition, you can choose from Two different types of glazing: 3 mm toughened glass and 10 mm polycarbonate glazing. 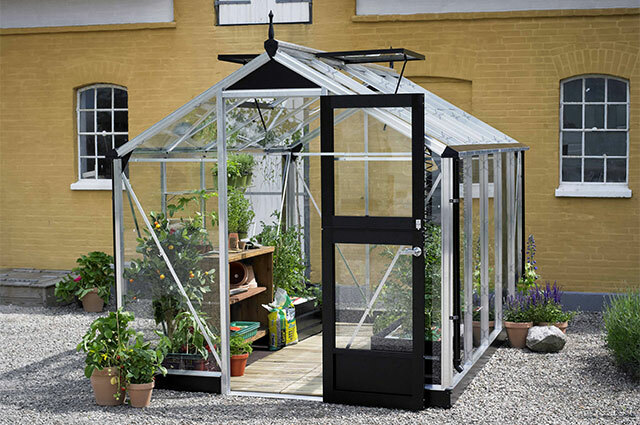 Juliana Compact is intended for the discerning consumer who prefers a small greenhouse but is willing to pay for quality, good functionality and splendid design. The tall sides and total height provide a good sensation of space and good working conditions. 10mm Clear TwinWall Polycarbonate is the R-value 1.79, U factor 0.560, 80% light transmission (Clear). Single glass is toughend glass to minimize any possibility of breakage or injury..